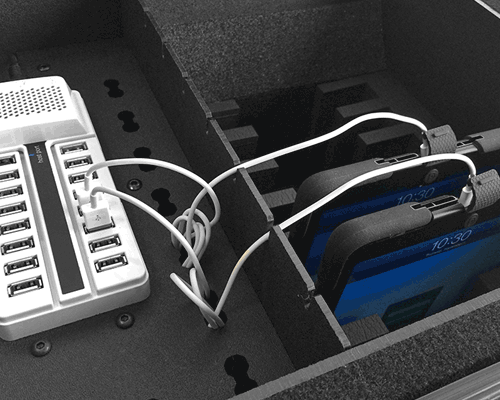 The CaseCruzer Extreme USB 3.0 Sync ‘N’ Charge Station 15 Pack and 30 Pack are compliant with the USAF information security requirements for the protection of electronic flight bags (EFB). 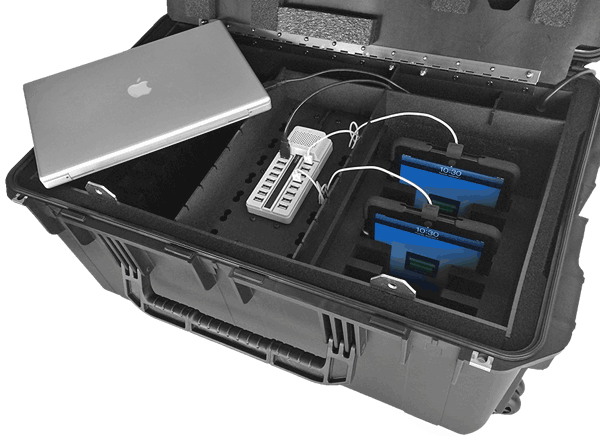 The mobile CaseCruzer Sync N Charge station eliminates the need to use WiFi for transfers of sensitive data and ensures the most secure cyber posture by synchronizing and charging via hardwire. This type of connection eliminates the tablets vulnerability to viruses and hacking. 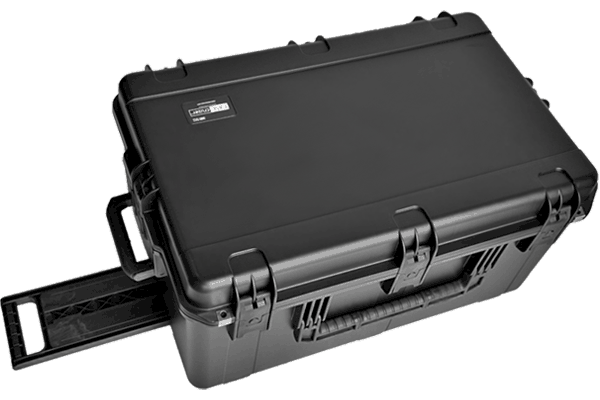 The CaseCruzer Extreme USB 3.0 allows navigation charts, digital publications and technical orders to be synchronized to other devices at speeds up to 5 Gbps of data streaming. 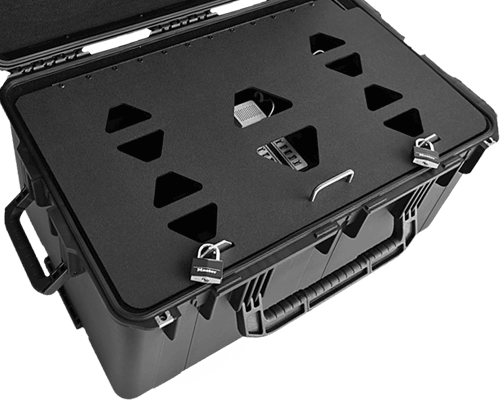 The CaseCruzer Sync N Charge promotes the safe sharing of information while preventing unauthorized access to the EFBs. Interior Locking door provides protection against theft when data is being transferred and/or iPads are being charged. Foam protection allows for a snug fit for iPads / tablets and protects against damage from shock and vibration. *iPad, Apple charger/cable, and iPad cover are not included. iPads are easily synced & charged via hard wire making for a secure data transfer done simply by connecting an Apple lightening cable to USB hub. *Case lid must stay open while iPad's sync & charge. 15 Port 3.0 USB hub plus a host port which allows for a laptop connection for syncing. Data streaming at up to 5 Gbps (high speed is only obtainable to devices / cables that are USB 3.0 compliant). USB cable included for Laptop to hub connection. Syncing / hard wire data transfer and charging is done simultaneously at full speed without dropping charge rate. Compatible with Mac OS and Windows (7, 8 and 10) and is futureproof & updatable. Internal fan provides the proper ventilation to protect against overheating. This product complies with the relevant safety standards to be C-UL-US Listed and with relevant standards required for CE EN60950 compliance. Uses tools such as Apple Configurator, iTunes or Android equivalents for synchronization.